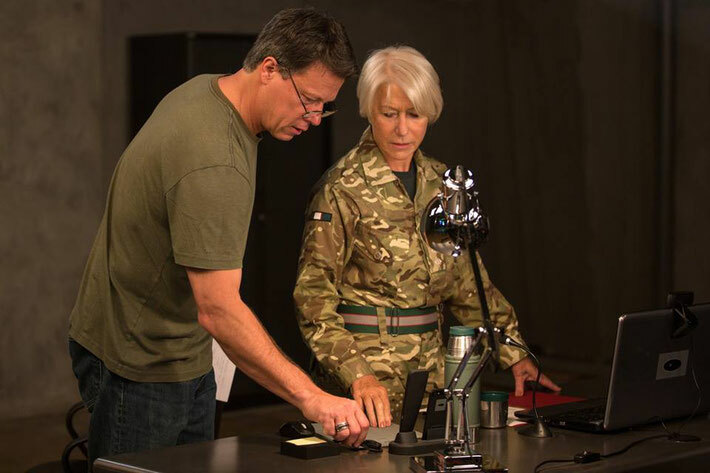 Colonel Katherine Powell (Helen Mirren) is a UK-based military officer in command of a top secret drone operation to capture ‘high value’ Al Shabaab terrorists in Kenya. The operation escalates from “capture” to “kill” when Powell discovers, via remote surveillance and on the ground intelligence, that the terrorists are planning a suicide bombing. However, as drone pilot, Steve Watts (Aaron Paul) is about to engage, a nine-year old girl enters the kill zone. This triggers an international debate (reaching the highest levels of British and American government) about what is an acceptable amount of collateral damage. Is the sacrifice of one, innocent child morally acceptable? Eye In The Sky is an intelligent and tremendously tense thriller about the moral and ethical implications of drone warfare. From multiple points of view along the “kill chain” of power, director, Gavin Hood (Enders Game, Tsotsi), shows us the preparation for a drone strike. He then leaves it up to us to decide what side of the debate we favour - quite a challenge in a movie where there are no easy answers. Eye In The Sky is an incredibly thought provoking film. It is a movie that will trouble the mind long after its credits have rolled. This is also a timely and important film. It raises many difficult questions - questions that we need to consider as the world moves towards a future of remote warfare. As soon as Gavin Hood read Guy Hibbert’s script for Eye In The Sky, he knew that he wanted to direct this movie. The script, which Hibbert had worked on for eight years, was utterly gripping and the subject matter fascinated him. Hood then spent a month researching the topic of drone warfare before he made his pitch to producers Colin Firth and Ged Doherty. Hood was keen to bring Hibbert’s powerful story to life. However, the director did want to make one, significant change. In the original script, the role of the British Colonel was written for a man. 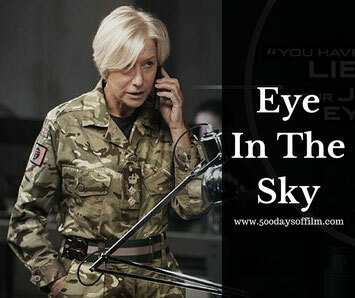 To prevent Eye In The Sky from becoming a ‘guys only war movie’, Hood decided to place a woman in that role - and one woman in particular: Helen Mirren. What an inspired decision that was - Mirren is superb. Hers is a powerful, often chilling, screen presence and she brings both intelligence and emotional nuance to her role. Mirren’s performance is even more impressive when you realise that, due to budgetary constraints, she had to act in front of a green screen while Hood read the dialogue from the other characters. At no point did she (or Aaron Paul, whose performance also stands out) see the drone footage. Eye In The Sky is also noteworthy, of course, because it features the last performance from the wonderful Alan Rickman (although we will hear his extraordinary voice one more time in Tim Burton’s Alice Through The Looking Glass). 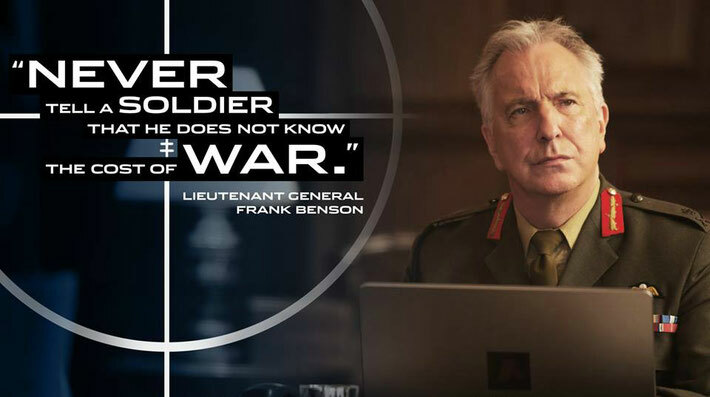 Rickman is absolutely perfect in his role as Lieutenant General Frank Benson. Benson is Powell's superior officer. He also advises a select group of government officials as they decide whether to authorise the mission’s transition from “capture” to “kill”. In addition, Benson provides relief from the mounting tension in the film. And, boy, do we need that relief. Of course, the drone attack is no laughing matter. However, there is dark humour in the ridiculousness of his situation - particularly as one official after another fails to make a decision and “refers up” instead. To my mind, no one but Rickman could pull this off. Who else could convey so much with one raised eyebrow? Who could imbue so much tension just by uttering the word “now”? No one that's who. It still seems impossible to me that he is gone. He is (and always will be) much missed. Thank goodness he left us such an amazing legacy of superb cinematic performances. By the end of Eye In The Sky, I was a ball of tension and conflict. Much credit for this goes to the film’s editor, Megan Gill. She has done a simply phenomenal job of piecing together all the disparate scenes in the film. No small task when you consider that pretty much every player is in a different location, from London, to Nevada, from China to Kenya. Gill’s editing moves Eye In The Sky back and forth between all of these locations. Largely thanks to her work (and of course Hibbert’s script and Hood’s direction) what could have been confusing, becomes seamless and remarkably easy to follow. In order to make Eye In The Sky as close as possible to the actual line of command that such an operation would entail, Hood enlisted the help of two military advisors with over 25 years of experience. In addition, an ex-lawyer himself, Hood also spent time with legal professionals in order to ensure the film's authenticity. Eye In The Sky certainly succeeds in its aim of raising awareness about drone warfare. The surveillance technology alone is pretty eye opening. When Barkhad Abdi (whose post-Captain Phillips performance is scene stealing) starts to fly his beetle drone (or his micro aerial vehicle to be precise), I was left wondering how much of this technology was actually real. Eye In The Sky is a thrilling and thought provoking film. It is also hugely enjoyable to watch, despite leaving me feeling pretty devastated by the end. Since I left the cinema, I haven’t stopped thinking about the moral implications of drone warfare and what I would do if I was (unlikely I know) part of the kill chain. The only thing I know for certain is that, while there are no easy answers, we shouldn’t stop asking these ethical questions. Eye In The Sky writer, Guy Hibbert, has spent much of his career writing for television. He wrote, for example, the screenplay for Prime Suspect: The Scent Of Darkness. Did you know that post traumatic stress disorder (PTSD) is higher in drone operators than among more conventional bomber pilots? The reason for this seems to be that drone pilots spend more time observing their targets before launching an attack. In addition, while conventional pilots can drop their bombs and zoom away, drone pilots have to remain and witness (as we see with Aaron Paul’s character, Steve Watts) the impact of their actions. Barkad Abdi has spoken about how personal Eye In The Sky felt. He knows what it is like to be an innocent person in the middle of a war situation, having had to escape from the Somali civil war. Hood has a cameo acting role in Eye In The Sky. The South African actor/director plays Lt. Colonel Ed Walsh. Have you seen Eye In The Sky? If so, what did you think about this film? I would love to know - do feel free to leave a comment in the box below! Really enjoyed this....I'm all the more impressed after learning that Helen Mirren and Aaron Paul couldn't see the drone footage they were reacting to! Superb acting!